Frankfurt is a multicultural city where a variety of languages can be heard – one in three of its inhabitants are not German. The native city of Goethe, Frankfurt is a financial, scientific, sports and cultural hub. It is to this continually active city that the Novotel hotels of Frankfurt welcome you for a change of scene. The city of Frankfurt is built along the River Main. A bridge, the Alte Brücke, crosses the river and links two important districts of the city. On one side, you have the old city centre with its many historic alleys built around Romerberg Square, at the centre of which is the Fountain of Justice. Shopping enthusiasts should visit the shops in the Zeilstraße. On the other side of the bridge is the Sachsenhausen district, where you can enjoy local specialities, such as Apfelstrudel and Apfelwein, well worth the trip! A modern city with an urban panorama, its central business district houses the Commerzbank tower and the headquarters of the European Central Bank. Lovers of art and culture will find that Frankfurt is the ideal city to tour. You will find the Städel Museum, where you can admire works by Picasso, Monet and Rembrandt, and the Frankfurt Cathedral Museum. Book lovers will discover that Frankfurt has a history going back 500 years of organising the biggest book fair in the world every October. As you stroll around Frankfurt, you will discover its tradition in its taverns with their old-world charm and the avant-garde nightlife. 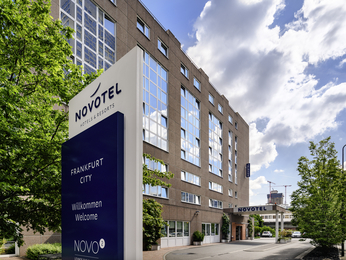 Discover Frankfurt’s mix of eras by booking a stay in one of the two Novotel hotels in the city and its surroundings.